Democratic presidential candidate Bernie Sanders joined 17 other senators in cosponsoring a bill to make Washington, DC the 51st state. Under the proposed legislation, residents of “New Columbia” would obtain full representation in Congress. 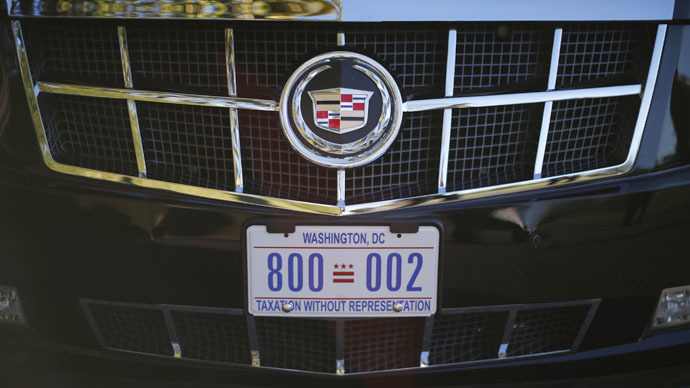 The bill, entitled the New Columbia Admission Act, would separate the federal parts of DC from the residential areas that currently comprise the majority of the city. The areas surrounding the White House, the Capitol, the Supreme Court and the National Mall would remain as the seat of the federal government, and would still be called the District of Columbia. The rest of the area would become the state of New Columbia. Sanders, an independent senator from Vermont, told The Hill newspaper in a statement that it is "morally wrong" to block District residents from federal representation. Sen. Tom Carper (D-Delaware) introduced the bill, along with 18 original cosponsors. “The District of Columbia is not just a collection of government offices, monuments and museums. It is home to more than 600,000 people who build lives, families, and careers here. These Americans serve in our military, die defending our country, serve on our juries, and pay federal taxes,” Carper said in a statement. Del. Eleanor Holmes Norton (D-District of Columbia) introduced HR 317, the companion legislation, in the House of Representatives in January with a total of 120 cosponsors, all of whom are Democrats. She thanked Carper for his work on gaining statehood for DC. “Today, as ranking member, [Carper] once again demonstrated his commitment to equal rights for D.C. residents by reintroducing his statehood bill. We are enormously grateful. I am particularly delighted that he took the time and care also to attract a historic number of original cosponsors, including Senate leaders,” Holmes Norton said in a statement. As a delegate, Holmes Norton is only able to vote in committees, not on legislation that reaches the House floor or as a part of the Committee of the Whole. The same is true for delegates from the US territories of the Virgin Islands, Guam, American Samoa and the Commonwealth of the Northern Mariana Islands. Likewise, Puerto Rico ‒ which is represented by a resident commissioner instead of a delegate ‒ does not have full voting rights in the House. Resident Commissioner Pedro Pierluisi (D-Puerto Rico) introduced a bill that would admit the island to the union in February. HR 727, known as the Puerto Rico Statehood Admission Process Act, with a total of 108 cosponsors, 14 of whom are Republican. Along with Carper and Sanders, the New Columbia bill’s cosponsors include Minority Leader Harry Reid (D-Nevada), Cory Booker (D-New Jersey), Patrick Leahy (D-Vermont), Charles Schumer (D-New York), and Elizabeth Warren (D-Massachusetts). Similar legislation was introduced in the Senate in 1993 and was supported by several of the same lawmakers. In the House, Sanders cosponsored the companion legislation, which Schumer, Sens. Sherrod Brown (D-Ohio), Ben Cardin (D-Maryland) and Richard Durbin (D-Illinois) voted in favor of, along with now-Sens. Maria Cantwell (D-Washington), Bob Menendez (D-New Jersey), and Ron Wyden (D-Oregon). Almost two thirds of House Democrats and one Republican voted for that iteration of the bill. Holmes Norton introduced the DC House Voting Rights Act, which would have given DC residents a voting representative in the House. That legislation passed the House in 2007 and the Senate in 2009, but was derailed by an amendment that would have eliminated the city’s stringent gun safety laws, according to the delegate. It was also introduced in the 113th Congress with 21 cosponsors, but lawmakers adjourned without taking any action on the bill.